No matter what you write or aspire to write, approaching writing as a spiritual practice will deepen your experience of yourself, your life and your creation as well. 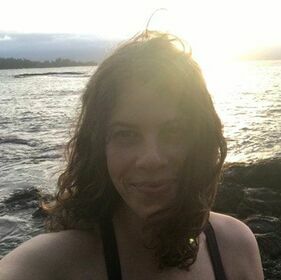 In this 3-hour afternoon workshop, Nina Schnall, Artistic Director of the Yoga of Writing Quarterly Series, will offer a combination of movement, breathing and writing exercises to clear the way for creative writing and the play of the imagination. She will also introduce approaches to writing inspired by Christopher P. Delorenzo, Helen Klonaris and Jane Brunette, our guest teachers in the Yoga of Writing series. ​Born and raised in New York City, Nina now resides in Oakland, California where she writes, teaches and studies dance. She has a Masters in Cultural Anthropology from the University of California, Santa Cruz, and a Masters in Fine Arts from the California Institute of Integral Studies. A Fulbright scholar to Haiti, Nina brings a scholarly and experiential approach to spiritual practice. She facilitates writing and mindfulness workshops in the Bay Area and also works one on one to support people transform their lives through story. She writes personal essays and fiction and is finishing her first novel. "Go to yoga," a voice in my head said one day. I was living in post 9/11 New York City, having recently returned from Ph.D. fieldwork in Haiti where political instability was leading up to invasion and a coup d'état. I was trying to write a dissertation, but my academic training had taught me to bypass my emotions and I couldn't do that anymore: my nervous system was short-circuiting and my emotions were invading me. Rather than repel them, I started to realize that they could be an important source of knowing and creativity. As Ann Dyer Cervantes says, yoga class is a "safe space to fall." A place where I could feel and—with conscious breathing and movement—create space for reflection and curiosity. With yoga, when I became lost in my head or overwhelmed with an emotion, I would find my way home on my mat with breath and gentle movement. Sometimes all I needed was to sit with one hand on my belly and the other on my heart. This gesture of compassion broke through overwhelm, self-judgment and shame. I realized that my yoga practice and writing practice were connected. Rather than write from my head in a way that was unrelated to what I was really feeling, I could write from my body. I found space in my yoga practice for the kind of curiosity about my experience that I could then put into words and share with others, as well as reflect upon myself. My personal practice turned into workshops: "Yoga Passover for Liberation," then "Writing for the Day of the Dead," "Writing from the Senses" and "Wording the Unconscious." The workshop ideas kept coming, and people kept showing up for them. I based the workshops on my 15+ years of working with writing process groups that grew out of 19th literary societies where freed slaves and women came together to learn how to write, find their voices, and share their stories. Although the literary societies had western roots, I think they were very yogic in nature. They were based on truthfulness (satya), non-harming (ahimsa), and true self-study (swadhaya). Combining writing and yoga allow us to learn how to listen to ourselves and to each other deeply and see with appreciation and love. In a recent On Being interview, Maria Popova, creator of Brain Pickings said to the host. Krista Tippett: "I used to marvel for a long time why my best ideas. . . . .came to me at the gym, or on my bike or in the shower. . . .these are simply the most unburdened spaces in my life." Bringing your yoga practice and your writing practice together will create unburdened spaces and room for profound insights in your writing. Yogic techniques promote body awareness, and a mind-body connection that deepen your writing and make it more visceral and alive. Yoga and writing combined can create a bridge between your mind and body, and yourself and the divine.